An impressive set of mainstream jazz with bop, Brazilian, and New Orleans influences that features eight of the alto saxophonist's original compositions and three reimagined standards. 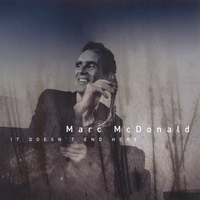 It Doesn’t End Here marks alto saxophonist and composer Marc McDonald’s long overdue debut as a leader on CD. Although his more than 25 years as a sideman include playing everything from punk to cabaret, It Doesn\'t End Here is comprised of Marc’s first love, namely mainstream jazz with bop, Brazilian, and New Orleans influences. The album highlights both Marc’s robust alto playing and his talents as a composer, with eight original compositions and three inventively re-imagined standards. Regardless of style or source, however, the music is distinguished by an approachability that doesn’t sacrifice depth. I liked the Cd. Good musicianship, good originals and fresh treatment to some standards.